BRICKFORM Strip-It™ BRICKFROM Strip-It is an environmentally sound and user-safe stripper for solvent-based sealers and paints. Strip-It may be used on all masonry surfaces including concrete, quarry tile, ceramic tile, terrazzo, cementitious overlays and other surfaces. Strip-It meets 2005 California Air Resources Board V.O.C. standards (less than 50% V.O.C. by weight). This video shows how to chemically remove an acrylic sealer from concrete using BRICKFORM STRIP-IT. 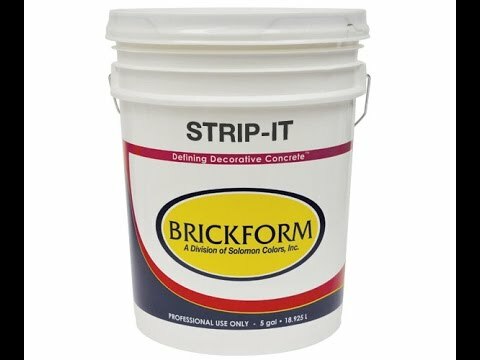 BRICKFORM Strip It is an environmentally sound and user safe stripper for water and solvent base sealers and paints. Strip It may be used on all masonry surfaces such as concrete, quarry tile, ceramic tile, terrazzo, cementitious overlays and other surfaces. Strip It is safe to use on all colored or imprinted concrete. Strip It contains no Methylene Chloride nor is it flammable. This product does not produce carcinogen hazards associated with petroleum solvents. Strip It meets 2005 California Air Resources Board V.O.C. standards (less than 50% V.O.C. by weight).